Amazing Ways to Save on your Next Visit! Relic Super Passes are just $26.99 when you purchase them online! LLT will be open early at 10am on Monday 4/22 for local school holidays. or purchase Relic Super Passes for just $26.99 all day. Choose from 2 specials at $9.99 each. Valid after 3pm. Unlimited laser tag OR maze, wall, bumper cars & ropes course. Note: Monday Night Madness will not be available on New Year’s Eve. 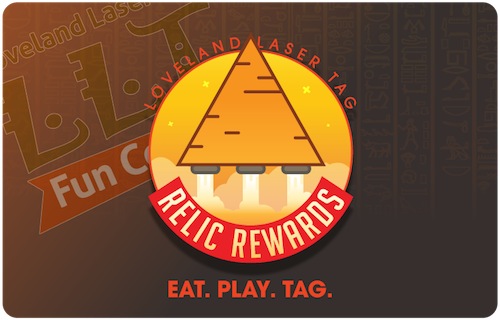 Every Wednesday, Relic Rewards members get a free $5 game card, $10 large pizzas & $15 Relic Super Passes! $15.99 All Attractions Passes from 3pm-9pm! Laser tag, laser maze, climbing wall, bumper cars & 1 ropes course session. Late night fun from 9pm-Midnight on Friday & Saturday nights! Or text “laserfuncenter” to 31996 for exclusive discounts and offers. Plus we’ll give you a free $10 arcade card just for signing up!